This was the right spring time book for an Easter read. I’ve seen more than one adaptation of this book on TV and movies. I also think I read at the very least an adapted version of this as a kid. I liked the transformation of spoiled and sour Mary into a kinder and more robust one. I was less interested in Colin and the move shifts more to him in the latter half. Dickon is a funny character too. I do genuinely like the kindness of the characters that Burnett writes about it here and in A Little Princess. 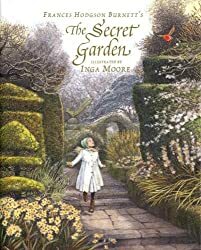 What I liked most about this book was that my hard cover was big and had lovely illustrations by Inga Moore. I think that was a big part of why I enjoyed the story as much as I did. As a child, I loved a similar style book of Peter Pan. It really makes a worthwhile reading experience when children’s books are presented this way. I read this book last year and adored it. I loved the 1993 film when I was a child but sadly I don’t remember reading the book. Hello Jessica! I barely remember reading it as a kid and definitely not the definitive version. I enjoy the films too. Thanks!